Woodwinds II contains all of the instruments necessary for the realization of large orchestral instrumentations, such as a piccolo, a second flute and an alto flute, a bass clarinet and a contrabassoon. To complete your woodwinds collection you will also find the small clarinet in Eb and two English horns, living up to the high standards professional composers have come to expect from our sampled instruments. 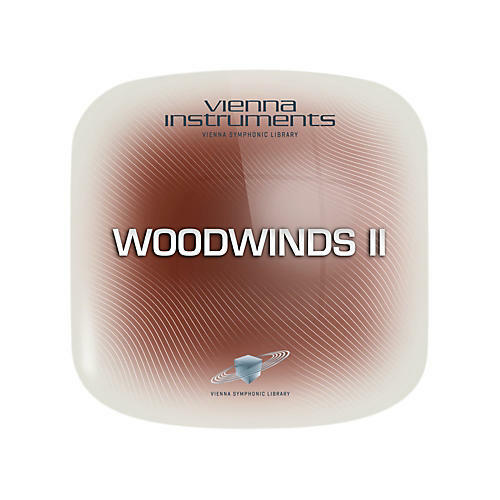 Your purchase also entitles you to download the free Vienna Instruments player software that includes the Vienna Ensemble mixing and host software. The Woodwinds II Full Library contains 67 GB of uncompressed sample data in 44.1kHz/24-bit. Due to an innovative optimization process, the Vienna Instruments engine decompresses the samples in real-time, so that they take up only 45 GB of space on your hard disk. Please note: Even if you licensed the Standard Library only, the Full Library of your Collection gets installed on your hard drive since Standard and Extended Library can't be separated due to structural database requirements. Other configurations may work but are not actively supported.